Cortissoz 52. Etching on wove paper, full margins. From a very small edition. Extremely rare. 10 11/16 x 7 11/16 in. ; 27.15 x 19.53 cm. Provenance: Kennedy Galleries, New York; unidentiified collector’s stamp verso; Abe M. Tahir, Jr. The Hassam is a beautiful Impressionist etching, with the subtle effects of atmosphere and light for which the artist is celebrated. He often depicted female figures and was especially intrigued by sunlight shining through trees creating interesting patterns of light and shadow. 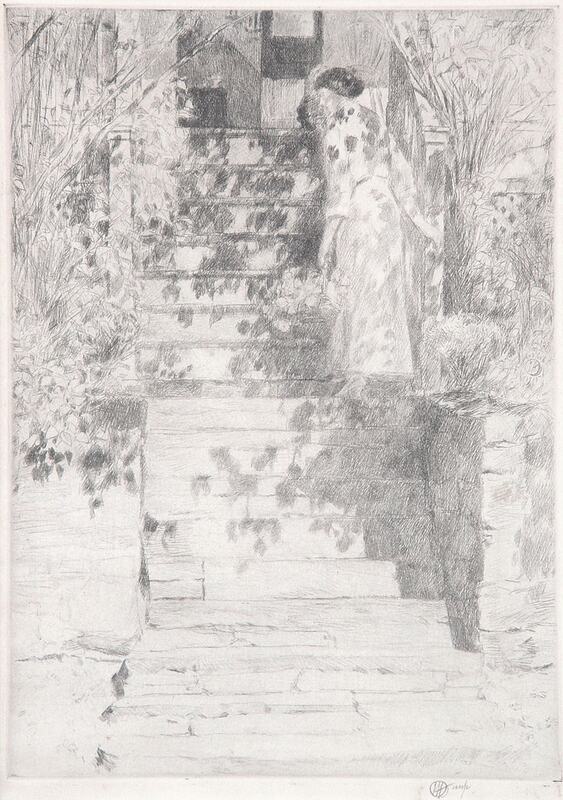 Like the other Impressionists, he worked directly from nature, and this is a portrait of Mrs. Elmer Livingston MacRae on the steps of the Holley House at Cos Cob.